Label M. are a brand which Im actually not that familiar with, A professional hair care brand that generally are in Toni and Guy Salons. I've been using this Honey and Oat Shampoo and Conditioner as my second hair washing (?) duo. My favourite hair washing (? Seriously what is the correct terminology?) 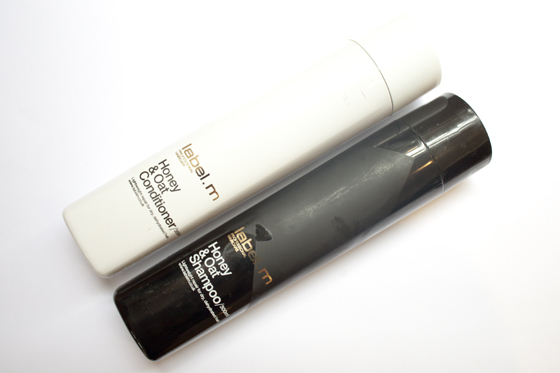 products are the Shampoo and Conditioner from the Ojon Dry Recovery Range. I wash my hair alot as I go to the gym almost everyday so I go through shampoo and conditioner like their is no tomorrow. To try and conserve some of my favourite shampoo and conditioner, I've been using a different set in the hope I don't use up all my Ojon stuff so quickly! The Honey and Oat Shampoo builds up to a nice lather and makes the hair feel very clean and clarified of any remaining hair product. I especially like the Honey and Oat Conditioner as it feels moisturising and smoothing as soon as you apply it. After using this my hair is left feeling, soft, smooth and incredibly clean and fresh smelling. The scent of honey and oat is very prominent, It's very sweet but not too sickly and I have found it does linger on the hair. I don't use scented products on my hair too often as I have a sensitive scalp but I've had no problems so far using this products! The sweetness might turn a few people off but I personally think it is really nice! Overall I have really enjoyed this product mainly for the smell and the fact that it's incredibly light weight. With long hair you don't really want to be using shampoo and conditioner thats going to add weight and pull it down flat onto the head. They are pretty pricey for 300ml of product, but I do really like them and would potentially purchase them again for myself in the future.